6LoWPAN is an acronym of IPv6 over Low-Power Wireless Personal Area Networks.6LoWPAN is the name of a concluded working group in the Internet area of the IETF. 6LoWPAN is a somewhat contorted acronym that combines the latest version of the Internet Protocol (IPv6) and Low-power Wireless Personal Area Networks (LoWPAN). 6LoWPAN, therefore, allows for the smallest devices with limited processing ability to transmit information wirelessly using an internet protocol. 6LoWPAN can communicate with 802.15.4 devices as well as other types of devices on an IP network link like WiFi. The 6LoWPAN concept originated from the idea that “the Internet Protocol could and should be applied even to the smallest devices,”and that low-power devices with limited processing capabilities should be able to participate in the Internet of Things. The 6LoWPAN group has defined encapsulation and header compression mechanisms that allow IPv6 packets to be sent and received over IEEE 802.15.4 based networks. IPv4 and IPv6 are the work horses for data delivery for local-area networks and wide-area networks such as the Internet. Likewise, IEEE 802.15.4 devices provide sensing communication-ability in the wireless domain. The inherent natures of the two networks though, are different. Smart home connecting devices using IPv6, is possible to gain distinct advantages over other IoT systems. The Thread initiative has been set up to standardize on a protocol running over 6LoWPAN to enable home automation. And OpenThread helps developers to have a smooth introduction to Thread and start developing smart home solutions. Smart Agriculture: enabling all kind of sensors used in agriculture and farming by connecting devices that are far away from each other in remote areas, the possibilities that this protocol gives us of building mesh networks makes it just the right one for this type of application. Industrial IoT: Automated factories and industrial plants provide a great opportunity for 6LoWPAN and using automation, can enable major savings to be made. The ability of 6LoWPAN to connect to the cloud opens up many different areas for data monitoring and analysis and predictive maintenance. 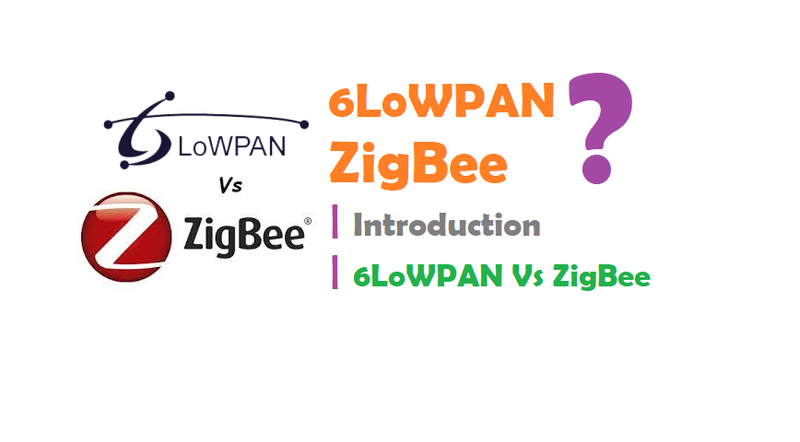 6LoWPAN is newest competitor to ZigBee. ZigBee, like 6LoWPAN, is designed for low data-rate and battery-powered applications. ZigBee is the most popular, low-cost, low-power wireless mesh networking standard on the market right now—and the more mature technology of the two (ZigBee, 6LoWPAN). It is typically implemented for personal or home-area networks, or in a wireless mesh for networks that operate over longer ranges. The ZigBee IP is built on the IEEE 802.15.4 standard, but unlike 6LoWPAN, it cannot easily communicate with other protocols. A benefit of ZigBee, however, is that nodes can stay in sleep mode most of the time, drastically extending battery life. The name is based on the wiggly dance that honey bees do on their way to drop off their honey. Like those crazy bees, data in a ZigBee network is “hopping” around a mesh of transceivers until a route to the host (usually the internet) is found. It is based on the IEEE 802.15 protocol, and has a fixed data-rate of 250 kbit/s. This speed, coupled with low-transmit power, means ZigBee does not have great range. Repeaters and/or a high density of nodes are often needed to obtain the desired coverage. IoTbyHVM.OOO is an attempt to help the people by sharing the knowledge and ideas about Internet of things and other technology related articles and videos. IoTbyHVM.OOO provides articles related to Arduino, Raspberry Pi, use of all general purpose sensors, circuits, home automation, drones, smart TV, voice control TV , Micro Controller etc. for DIY (Do it Yourself) purpose. Copyright © 2019 IoTbyHVM – Bits & Bytes of IoT. All rights reserved.